Today we will discuss CA vs CPA Differences like salary, course fees, career Opportunities and all the other differences between CA and CPA. CA vs CPA, The simple way to reach any conclusion is asking a question and clearing doubt and getting more clarity of your career choice. We begin with asking and answering as many possible questions that can hover a confused mind. CPA is a Certified Public Accountant under different country recognized bodies. (In this article we will make a comparison with AICPA (American Institute of Certified Public Accountants), considering the mass interest of the student in working at the USA). Whereas CA in India is Chartered accountant under ICAI ( Institute of Chartered Accountant of India ). If you are thinking the answer would be, you will just count and mint money, then you are right!! The CPA exam traditionally requires five years of education in accounting and business courses. In the Indian system, this is equivalent to a bachelor’s degree and a master’s degree, Whereas CA, can be done so after clearing 12th std exams in India. No, CA is the course which is intense and lengthy because of its holistic approach and diversified and sectoral economy of India. whereas CPA is totally focused on giving taxation and accounting knowledge of US.students need to clear only 4 paper to be CPA. Now after evaluating the course, syllabus you must be sure, is this what you want to do for your life. “Are you really keen in going to a foreign land and work for them or do you want to stay in your country and flourish in your career, due to developing status of the economy of India? If your answer is to go abroad, then let’s move further and make some more comparison to know the reality. CPA is expensive as compared to CA course. The cost incurred during the CPA course agitates due to traveling expenses and visa charges paid to appear in Exams. Yes, you are right, CPA exams are not held in India. Only recently, even though the tests were online, they required the Indian candidates to take the exam from the U.S. but as this course is gaining popularity the Indian candidates can appear for the CPA exam in Lebanon, United Arab Emirates, Kuwait, and Bahrain. Even after these changes, this course is 2 times costlier than CA courses which the only levy only ₹80,000 in India. The median salary for a CPA in the U.S. is $62,410 and in India ₹ 8–10 lakh per annum and the median salary for a CA in India is. 6.5 to 7.8 lakh per annum But, India only has a handful of the organization working under US accounting standards, hence the scope to get a good placement in India becomes a bit ambiguous. Now after calculating the cost involved and uncertainty of getting a good placement in India, make this course a less popular one among both. If you want to know more about Chartered accountant salary then you can with this link. No, as per ICAI rules a person who has passed both examinations as well as complete the internship as per Institute Norms, have to select the only profession at a time for practice. whereas according to recent changes in the eligibility criteria have made it difficult for candidates of Indian origin to pursue the exam. For instance, a bachelor’s degree along with a CA qualification is not accepted in some U.S. states. In the past though, the combined education was considered equivalent to a regular four-year bachelor program in the U.S.
in India, the dream of every household eyes was to earn in dollars. But with rigid immigration policy, drastic cultural differences and love for our own country India, have made a significant paradigm shift. 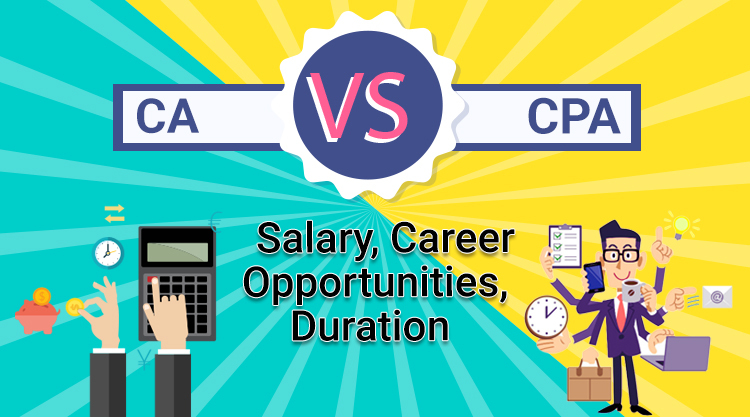 Here we told you CA vs CPA salary, duration, fees and all other difference between CA and CPA. Please read our series over comparison with different professions. course to get an insight. Keep yourself healthy and Swadeshi.